Wow, how beautiful! …Sometimes they make a really fancy gun case and give it as a gift at a potlatch. Then you would use it like a wall hanging; it’s not for practical use. It’s treasured the way you would treasure a picture. Muzzle-loading muskets and later rifles and shotguns were among the most valued items obtained through trade with the Hudson’s Bay Company. Men took great pride in their weapons and carried them in custom-made cases even when out on the trail. Elders thought that this fancy Gwich’in fringed and beaded moose-hide case was probably made as a potlatch gift rather than for everyday use. 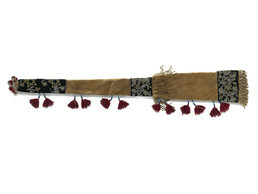 The flower, leaf, and star designs are worked entirely in expensive brass and steel beads (“steelies”), and the artist added tassels of red yarn, strung with blue glass beads. Eliza Jones: Wow, how beautiful. Trimble Gilbert: It be just right [size] for the muzzle-loader. Judy Woods: It sure is pretty. Eliza Jones: If you were to get a gun case today, would it be about that long? Trimble Gilbert: No, too narrow. Eliza Jones: . . . My husband, I think he talked about muzzle loader. Long stock, he said. Trimble Gilbert: Yes, long stock, right about this long. Eliza Jones: I mean not the stock . . . the barrel. Trimble Gilbert: . . . It’s called dink’ee dhah [gun case]. Eliza Jones: Old time beads. Kate, would you say these are all metal beads? Kate Duncan: I think they might be. Judy Woods: They look like it, because they’re all silver. Kate Duncan: They’re brass, which is very greenish-gold now. Eliza Jones: Oh, that’s what makes it green. The brass turn green? Kate Duncan: It turns green, like copper does. But these, they were gold once. See how gold they are there? Kate Duncan: Then these, Eunice Carney called these “steelies.” She said that’s what they used to call them. They’re a coated – I guess – iron based bead. Eliza Jones: Where’s Eunice Carney from? Kate Duncan: She was from Old Crow, but she lived much of her life in Ft. Yukon, so she was Gwich’in. And it’s beaded on velvet. And can you see the drawing? With the flour and water? Eliza Jones: Oh, flour paste. Kate Duncan: To draw this design. Eliza Jones: So even around here, you could see a little bit of it. Kate Duncan: And here, where she didn’t follow the pattern? . . . You see where she didn’t bead over it? Eliza Jones: Yeah, yeah! How amazing. Kate Duncan: It looks like maybe she ran out of beads? . . . There are very few solid metal beads. . . . I expect they were quite expensive, much more than glass beads. So this must have really been a big [for an important] man. Aron Crowell: So a really fancy gun case like this, would it be part of what you would dress up with for a potlatch or other event? Trimble Gilbert: A gift, just like this. And I know people still making it, few people. That’s about ten years ago. But they’re just giving it to the people, and they hang it on the wall. Eliza Jones: Four tassel right there on the end. Sometimes they make really fancy gun case, and it was given to people as gifts at pot latch. And then you would use it like a wall hanging. It’s not for practical use. It’s treasured like the way you would treasure a picture.